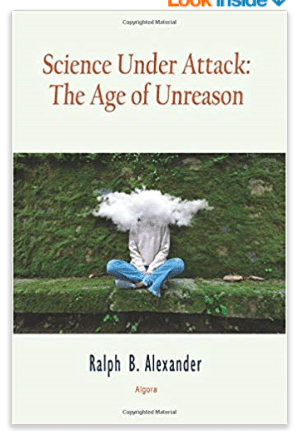 PhD physicist Ralph B. Alexander has authored a new book: Science Under Attack: The Age of Unreason. It amazes me that otherwise intelligent people can go along with this sort of contra logical response to finding that “consensus science” in one realm is bogus, then speaking as though “consensus science” in other realms can rightly be assumed valid . ?? Why would one not drop the blind faith in consensus science approach, and refrain from declaring any of this stuff completely settled science? No other response is logical, period, I say. Interesting points, thanks for the comments. I think biological warfare makes your point. Some very nasty bugs can be modified. Yer welcome . . and I could have said some controversial things about “creationism” being magically disproven too, but that’s what got me booted off WUWT . . it’s discussing “religion” to question GOS Evolution (Grand Origin Story) don’t ya know . . though, obviously, to me, GOS Evolution IS a religious faith. Tim Ball says the mainly left-wing “science skeptics” are actually logical positivists (LP). To anyone who doesn’t understand this: it harks back to debates in science before the 1980s (after which post-modernism because its thing, and turned the left into science zombies). When applied to science, LP was often termed “Scientism”. Back then, BH (before Hansen), the left were critical of Scientism. Today they are gung-ho supporters of it! How the worm turns eh? In consolation, there are some proper, vaguely left-wing, skeptics still around. For example, 3 groups: climate skeptics, nuclear power supporters critical of Linear No-Threshold Theory (LNT), and the so-called “data thugs” critical of bad statistics used, especially, in Social Psychology. In practice it’s pretty easy to tell the good skeptics from the bad. Good skeptics zero in on bad science ideas and malpractice. For example: how the “data thugs” take apart bad statistics of Social Psychology, how nuke-skeptics demonstrate that LNT was never scientific theory because it was never verified nor validated. Likewise good climate skeptics zero in on bad climate science. In contrast the new bad science skeptics of the left begin with personal attacks (ad hominem) and “appeal to authority”. E.g. You are a flat-eather, denier, Nazi, … We are the 97%, 99%, establishment, … That’s modern Scientism 2.0 for you! 1) I’m not implying that most climate skeptics are left; just that a small number of them. 2) I assume most of these “data thugs” are left. Because they’re academics and most academics are. 3) Many of the new generation of nuke engineers, and nuke proponents are left. Such are often, warmist nuke engineers, newly graduated. In other words: good skeptics zero in on specifics, and avoid generalities. Generalities are sweeping statements. These are only “true” to people who already accept them! Making sweeping statements is a kind of enforcement; a pointless thing for a skeptic to do, but something you might do when you’re not actually being skeptical. In short: Skepticism is as skepticism does.